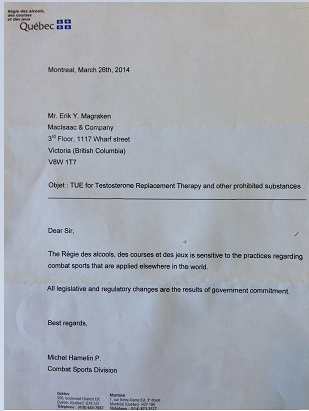 With the UFC coming to Quebec City for the TUF Nations Finale on April 16, 2014, I contacted the Quebec Athletic Commission (The Regie des alcools, des courses at des jeux) to determine if they have followed Nevada’s lead by banning TRT TUE’s or if these are still available in Quebec. Section 71.1 of Quebec’s Regulation Regarding Combat Sports specifically adopts the WADA prohibited list when it comes to Performance Enhancing Drugs. The Regulations do not specifically address the availability of TUE’s so I reached out to the Regie and asked what polices they have in force with respect to Therapeutic Use Exemptions for Testosterone Replacement Therapy and other prohibited substances. I requested a copy of their written policy and the standards required in order to obtain a TUE. The Regie’s answer, which I reproduce in full, is nothing short of perplexing. “Dear Sir, The Regie des alcools, des courses et des jeux is sensitive to the practices regarding combat sports that are applied elsewhere in the world. All legislative and regulatory changes are the results of government commitment“. So, are TRT TUE’s still available in Quebec and are any in place for the TUF Nations finale? Your guess is as good as mine.